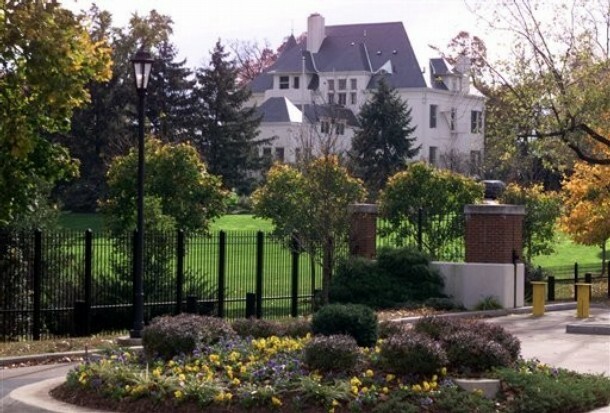 Number One Observatory Circle in Washington, D.C. is the official residence of the Vice President of the United States. Today in the Washington Post Opinions section Colbert King considers the REAL possibility of a Vice President Sarah Palin. Given what we know of Gov. Palin’s governing style in Alaska, imagine what she and her husband Todd Palin could do with access to the Internal Revenue Service, the Federal Bureau of Investigation, Central Intelligence Agency and the Pentagon at her (and his!) beck and call? It’s time to start taking Sarah Palin seriously. Though the latest polls show the Obama-Biden ticket ahead, the Alaska governor is still uncomfortably close to becoming vice president of the United States. The thought should concentrate the mind of every American who remembers the abuse of executive power by the administration of Richard Nixon. Just look at what Palin has done, in a short time, with the authority delegated to her by Alaskans. The “Troopergate” report, conducted by an independent investigator and released Friday by a bipartisan legislative committee, tells the tale. It documents the campaign that Palin and her husband Todd waged to get her former brother-in-law fired from the Alaska state troopers. I shudder to think of the Internal Revenue Service, the Federal Bureau of Investigation, Central Intelligence Agency and the Pentagon at her beck and call. The role played by Todd in carrying out his wife’s vendetta was highly unusual. He had no official duties in government. He acknowledged, however, that he made numerous calls to state officials to press his case against the governor’s ex-brother-in-law. It’s been well reported that Todd Palin’s involvement in his wife’s official business unsettled some Alaskans. He has been known to sit in on the governor’s meetings, use her office for his own meetings and intervene in state business using his status as “First Gentleman.” Clearly, he’s a man with a lot of time on his hands. What if he assumed the same role in Washington? Imagine Todd in a town that has no use for snow machines (which he loves to ride) or work for commercial fishermen (of which he is one, during the summer months). What would he do? Would he follow the vice president to her White House office? Join her meetings in the Situation Room? Sit in on her daily national security briefings? Where does Todd Palin stand on America anyway? Neither he nor Sarah Palin ever explained his seven-year membership in the Alaska Independence Party, a group that seeks a vote on secession from America. “I’m an Alaskan, not an American” was the slogan of the party’s founder, Joe Vogler, who also said “I’ve got no use for America or her damned institutions” and “I won’t be buried under their damned flag.” What made Todd Palin hitch his wagon to that anti-American train when Alaska offered the Democratic and Republican parties? Troopergate shows the Palins to be small-bore people unable to distinguish selfish personal interests from official responsibilities. Imagine the power of the U.S. government at their disposal. The prospect of Vice President Sarah Palin is no laughing matter. We have survived another week of Gov. Sarah Palin’s dangerous character assassinations against presidential candidate Barack Obama in which she whipped up McCain supporters to the point where some in the crowds were even shouting “terrorist” and “kill him” in reference to Sen. Obama. Tremendous mainstream media coverage has been spent debating Barack Obama’s past “extremists” connections, while virtually little if any attention is given to Gov. Palin’s own personal and political extremists associations. In an excellent in-depth examination by Max Blumenthal and David Neiwert, and with research support by the Nation Institute Investigative Fund, Salon.com published yesterday a lengthy article for voters’ consideration on Alaska Governor Sarah Palin ties to “radical” right wing leaders. On the afternoon of Sept. 24 in downtown Palmer, Alaska, as the sun began to sink behind the snowcapped mountains that flank the picturesque Mat-Su Valley, 51-year-old Mark Chryson sat for an hour on a park bench, reveling in tales of his days as chairman of the Alaska Independence Party. The stocky, gray-haired computer technician waxed nostalgic about quixotic battles to eliminate taxes, support the “traditional family” and secede from the United States. Though Chryson belongs to a fringe political party, one that advocates the secession of Alaska from the Union, and that organizes with other like-minded secessionist movements from Canada to the Deep South, he is not without peculiar influence in state politics, especially the rise of Sarah Palin. An obscure figure outside of Alaska, Chryson has been a political fixture in the hometown of the Republican vice-presidential nominee for over a decade. During the 1990s, when Chryson directed the AIP, he and another radical right-winger, Steve Stoll, played a quiet but pivotal role in electing Palin as mayor of Wasilla and shaping her political agenda afterward. Both Stoll and Chryson not only contributed to Palin’s campaign financially, they played major behind-the-scenes roles in the Palin camp before, during and after her victory. When Chryson first met Sarah Palin, however, he didn’t really trust her politically. It was the early 1990s, when he was a member of a local libertarian pressure group called SAGE, or Standing Against Government Excess. (SAGE’s founder, Tammy McGraw, was Palin’s birth coach.) Palin was a leader in a pro-sales-tax citizens group called WOW, or Watch Over Wasilla, earning a political credential before her 1992 campaign for City Council. Though he was impressed by her interpersonal skills, Chryson greeted Palin’s election warily, thinking she was too close to the Democrats on the council and too pro-tax. The AIP was born of the vision of “Old Joe” Vogler, a hard-bitten former gold miner who hated the government of the United States almost as much as he hated wolves and environmentalists. His resentment peaked during the early 1970s when the federal government began installing Alaska’s oil and gas pipeline. Fueled by raw rage — “The United States has made a colony of Alaska,” he told author John McPhee in 1977 — Vogler declared a maverick candidacy for the governorship in 1982. Though he lost, Old Joe became a force to be reckoned with, as well as a constant source of amusement for Alaska’s political class. During a gubernatorial debate in 1982, Vogler proposed using nuclear weapons to obliterate the glaciers blocking roadways to Juneau. “There’s gold under there!” he exclaimed. Vogler made another failed run for the governor’s mansion in 1986. But the AIP’s fortunes shifted suddenly four years later when Vogler convinced Richard Nixon’s former interior secretary, Wally Hickel, to run for governor under his party’s banner. Hickel coasted to victory, outflanking a moderate Republican and a centrist Democrat. An archconservative Republican running under the AIP candidate, Jack Coghill, was elected lieutenant governor. Hickel’s subsequent failure as governor to press for a vote on Alaskan independence rankled Old Joe. With sponsorship from the Islamic Republic of Iran, Vogler was scheduled to present his case for Alaskan secession before the United Nations General Assembly in the late spring of 1993. But before he could, Old Joe’s long, strange political career ended tragically that May when he was murdered by a fellow secessionist. Hickel rejoined the Republican Party the year after Vogler’s death and didn’t run for reelection. Lt. Gov. Coghill’s campaign to succeed him as the AIP candidate for governor ended in disaster; he peeled away just enough votes from the Republican, Jim Campbell, to throw the gubernatorial election to Democrat Tony Knowles. Despite the disaster, Coghill hung on as AIP chairman for three more years. When he was asked to resign in 1997, Mark Chryson replaced him. Chryson pursued a dual policy of cozying up to secessionist and right-wing groups in Alaska and elsewhere while also attempting to replicate the AIP’s success with Hickel in infiltrating the mainstream. Unlike some radical right-wingers, Chryson doesn’t put forward his ideas freighted with anger or paranoia. And in a state where defense of gun and property rights often takes on a real religious fervor, Chryson was able to present himself as a typical Alaskan. Chryson further streamlined the AIP’s platform by softening its secessionist language. Instead of calling for immediate separation from the United States, the platform now demands a vote on independence. At its 1992 convention, the AIP hosted both Phillips — the USTP’s presidential candidate — and militia-movement leader Col. James “Bo” Gritz, who was campaigning for president under the banner of the far-right Populist Party. According to Chryson, AIP regulars heavily supported Gritz, but the party deferred to Phillips’ presence and issued no official endorsements. In Wasilla, the AIP became powerful by proxy — because of Chryson and Stoll’s alliance with Sarah Palin. Chryson and Stoll had found themselves in constant opposition to policies of Wasilla’s Democratic mayor, who started his three-term, nine-year tenure in 1987. By 1992, Chryson and Stoll had begun convening regular protests outside City Council. Their demonstrations invariably involved grievances against any and all forms of “socialist government,” from city planning to public education. Stoll shared Chryson’s conspiratorial views: “The rumor was that he had wrapped his guns in plastic and buried them in his yard so he could get them after the New World Order took over,” Stein told a reporter. 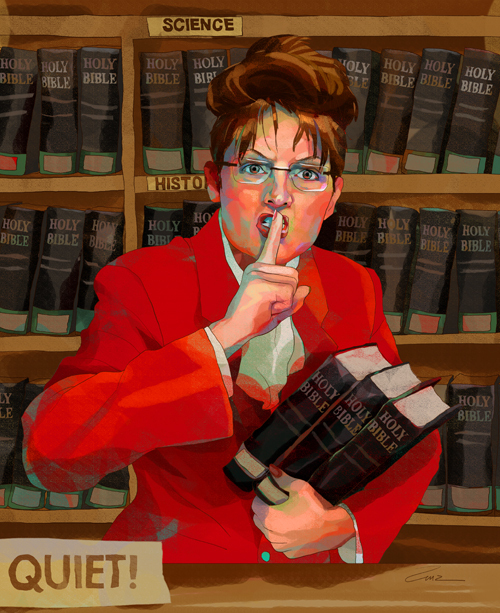 After intense evangelizing by Chryson and his allies, they claimed Palin as a convert. “When she started taking her job seriously,” Chryson said, “the people who put her in as the rubber stamp found out the hard way that she was not going to go their way.” In 1994, Sarah Palin attended the AIP’s statewide convention. In 1995, her husband, Todd, changed his voter registration to AIP. Except for an interruption of a few months, he would remain registered was an AIP member until 2002, when he changed his registration to undeclared. In 1996, Palin decided to run against John Stein as the Republican candidate for mayor of Wasilla. While Palin pushed back against Stein’s policies, particularly those related to funding public works, Chryson said he and Steve Stoll prepared the groundwork for her mayoral campaign. Indeed, Chryson boasted that he and his allies urged Palin to focus her campaign on slashing character-based attacks. For instance, Chryson advised Palin to paint Stein as a sexist who had told her “to just sit there and look pretty” while she served on Wasilla’s City Council. Though Palin never made this accusation, her 1996 campaign for mayor was the most negative Wasilla residents had ever witnessed. While Palin played up her total opposition to the sales tax and gun control — the two hobgoblins of the AIP — mailers spread throughout the town portraying her as “the Christian candidate,” a subtle suggestion that Stein, who is Lutheran, might be Jewish. “I watched that campaign unfold, bringing a level of slime our community hadn’t seen until then,” recalled Phil Munger, a local music teacher who counts himself as a close friend of Stein. When Palin won the election, the men who had once shouted anti-government slogans outside City Hall now had a foothold inside the mayor’s office. Palin attempted to pay back her newfound pals during her first City Council meeting as mayor. In that meeting, on Oct. 14, 1996, she appointed Stoll to one of the City Council’s two newly vacant seats. But Palin was blocked by the single vote of then-Councilman Nick Carney, who had endured countless rancorous confrontations with Stoll and considered him a “violent” influence on local politics. Though Palin considered consulting attorneys about finding another means of placing Stoll on the council, she was ultimately forced to back down and accept a compromise candidate. Emboldened by his nomination by Mayor Palin, Stoll later demanded she fire Wasilla’s museum director, John Cooper, a personal enemy he longed to sabotage. Palin obliged, eliminating Cooper’s position in short order. “Gotcha, Cooper!” Stoll told the deposed museum director after his termination, as Cooper told a reporter for the New York Times. “And it only cost me a campaign contribution.” Stoll, who donated $1,000 to Palin’s mayoral campaign, did not respond to numerous requests for an interview. Palin has blamed budget concerns for Cooper’s departure. The following year, when Carney proposed a local gun-control measure, Palin organized with Chryson to smother the nascent plan in its cradle. Carney’s proposed ordinance would have prohibited residents from carrying guns into schools, bars, hospitals, government offices and playgrounds. Infuriated by the proposal that Carney viewed as a common-sense public-safety measure, Chryson and seven allies stormed a July 1997 council meeting. When Carney tried later in the meeting to have the ordinance discussed officially at the following regular council meeting, he couldn’t even get a second. His proposal died that night, thanks to Palin and her extremist allies. “With Sarah as a mayor,” said Chryson, “there were a number of times when I just showed up at City Hall and said, ‘Hey, Sarah, we need help.’ I think there was only one time when I wasn’t able to talk to her and that was because she was in a meeting. Chryson says the door remains open now that Palin is governor. (Palin’s office did not respond to Salon’s request for an interview.) While Palin has been more circumspect in her dealings with groups like the AIP as she has risen through the political ranks, she has stayed in touch. Clark’s assertion that Palin was once a card-carrying AIP member was swiftly discredited by the McCain campaign, which produced records showing she had been a registered Republican since 1988. But then why would Clark make such a statement? Why did he seem confident that Palin was a true-blue AIP activist burrowing within the Republican Party? The most salient answer is that Palin was once so thoroughly embedded with AIP figures like Chryson and Stoll and seemed so enthusiastic about their agenda, Clark may have simply assumed she belonged to his party. Now, Palin is a household name and her every move is scrutinized by the Washington press corps. She can no longer afford to kibitz with secessionists, however instrumental they may have been to her meteoric ascendancy. This does not trouble her old AIP allies. Indeed, Chryson is hopeful that Palin’s inauguration will also represent the start of a new infiltration. Is Gov. Palin a Member of ‘Spiritual Warfare’ Prayer Group? An Alaskan “Strategic Prayer Network” leader, Mary Glazier, who claims to be a “witch-hunter,” says Palin is part of her “prayer group.” Bruce Wilson, writing for AlterNet.org, lies out the case for concerns every voter should have in this vice presidential candidate’s objectivity in the seperation of church and state. Please Note: The video posted with this article is silent for the first 45 seconds. Please watch it in its entirety if you are interested in hearing Mary Glazier’s claims. “I believe in warfare. We were given an assignment in Alaska … we had the very liberal candidates running for governor, and we began to pray for God to give us a Christian,” declared Mary Glazier. At a three day religious conference held in Everett, Washington last summer, on June 13, 2008, Glazier described how, nearly two decades ago, her movement helped propel Alaska Independence Party candidate Walter J. Hickel, in an upset write-in campaign, into the Alaska governor’s office: Glazier’s new prayer group member, a 24 year old woman named Sarah Palin, would later follow. Like Thomas Muthee, Mary Glazier describes waging personal battles against witches and witchcraft and, also like Muthee, Mary Glazier appears to have a special religious connection to Sarah Palin. Bishop Thomas Muthee, in an October 2005 ceremony at the Wasilla Assembly of God, anointed and blessed Sarah Palin as a political leader. Pastor Torp of Oslo, Norway, is an Apostle in C. Peter Wagner’s International Coalition of Apostles, a network of about 500 apostles in the United States and 42 other nations. Torp reported in Norwegian that he had been visiting C. Peter Wagner and Wagner’s wife Doris during the previous week, at the time when Palin was named as a vice-presidential candidate. Torp noted the excitement about Palin in the media but pointed out an interesting thing he said has not received much attention in the US — that Sarah Palin is a member of the prayer networks under Peter Wagner and his Alaska prayer-leader, Mary Glazier. 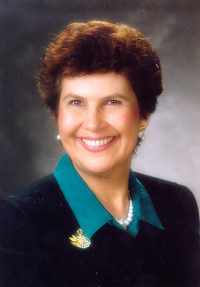 Mary Glazier is one of the Prophets of Wagner’s inner circle of leadership, the Apostolic Council of Prophetic Elders. The New Apostolic Reformation is the name that Wagner has given to the structure that he formed in the late 1990s to bring together numerous strands of the “Third Wave of the Holy Spirit” into a distinct and identifiable structure. The June 13, 2008, “Opening the Gate for Heaven on Earth: Receiving the New Prophetic Wind for Increase” conference, in Everett, Washington, was attended by Wagner and his top Apostles and Prophets. Mary Glazier is the Alaska state leader of Wagner’s U.S. Strategic Prayer Network. Sarah Palin has been anointed through the laying on of hands in at least four publicized ceremonies. Three of these have been captured on existing video or photographs — including the photographs posted on the official State of Alaska site. Currently the most widely published account is the video of the anointing by Kenyan pastor Thomas Muthee at the Wasilla Assembly of God before Palin was elected governor of Alaska. While a number of media outlets have featured stories of Muthee’s witch hunting exploits in Kiambu, Bishop Muthee is not just any witch hunter. He is internationally known for his starring role in the Transformations I video, produced in 1999, as one of the definitive media tools for the new evangelizing efforts of the Third Wave and the resulting New Apostolic Reformation. The New Apostolic Reformation is now a distinct entity with its own theology, apostolic networks, schools, school accreditation system, conferences, and media. The Apostolic structure, as defined by Wagner, provides a network of authority or “apostolic covering.” Each of Wagner’s approximately 500 Apostles has networks of their own, some claiming hundreds or even thousands of ministries under their authority. They view themselves as conducting “the most radical restructuring of Christianity since the Reformation” and believe they are unifying an end time church that will harvest millions of souls before the return of Jesus. C. Peter Wagner declared 2001 as the beginning of the New Apostolic Age, but by 1999 the movement was already coalescing around the new spiritual warfare theology presented in the Transformations video and related books. Thomas Muthee has played a key role as an example of the success that can be achieved through the expulsion of demons from communities. This spiritual warfare was not limited to Africa. The Transformations I video also featured Almolonga, Guatemala; Cali, Colombia; and Hemet, California. In Hemet, spiritual warriors supposedly succeeded in burning down a Transcendental Meditation center through spiritual mapping and prayer. In the video, narrator George Otis and participating local ministers claim that the area was transformed when “Spirit-filled Christians” took control of the government and public schools. [See the article Palin, Muthee, and the Witch-Journalists Miss the Major Story for more on the Transformations video]. This and subsequent video productions were shown around the world and the media effort spawned a number of Transformation evangelizing conferences and networks. Transformation became a buzzword for the faith-based social programs built around the evangelizing of communities. Transforming Melbourne is a city wide renewal group which prominently publicizes testimony of New Apostolic Prophetess Ana Mendez. Mendez participated with Wagner’s wife Doris and other top Apostles and Prophets on a 1997 mission to the Himalayas named “Operation Ice Castle.” This was a spiritual warfare venture to combat the chief of all territorial demons, the “Queen of Heaven.” Wagner would later write a bout this excursion in his books, “Confronting the Queen of Heaven,” and “The Queen’s Domain,” concerning the demon he believes is responsible for preventing acceptance of the gospel in Roman Catholic Churches as well as Islam. Mendez’s testimony of the event publicized on Transforming Melbourne, and other sites, includes her belief that their prayer expedition may have had many successful results including the death of Mother Theresa. Glazier’s sermon, which featured her comments on Palin, was given at a conference Opening the Gate of Heaven on Earth, that also featured a number of speeches and sermons–on the plans of leaders of the New Apostolic Reformation to take control of society and government through their “Seven Mountains Strategy.” These efforts to take control of religion, family, education, arts and entertainment, media, government, and business are clearly defined in their publicity and in numerous conferences on their efforts. Thomas Muthee quite plainly laid out the need to take over the seven “kingdoms” in the short sermon, or speech, Muthee gave before the anointing of Sarah Palin. A striking feature of the ministries of the New Apostolic Reformation is their use of militant terminology. Diane Buker, the state leader for Florida is head of a ministry titled Battle Axe Brigade. The website features an animated arm swinging a mace as well as articles claiming that Roman Catholicism and Mormonism are corrupt religious systems and that Roman Catholicism is bound by a religious spirit. Cindy Jacobs, another Prophetic Elder, has a ministry titled Generals of Intercession and Jacobs has authored books such as Possessing the Gates of the Enemy, a Training Manual for Militant Intercession. Ana Mendez (Ferrell), a Prophetess in the Wagner Apostolic network system, believes she may have helped kill Mother Theresa. George Otis included an entire glossary on new spiritual warfare terms in the back of his book “Informed Intercession.” Ed Kalnins of Wasilla Assembly of God and Thomas Muthee, both of whom have anointed Palin, include exhortations of violence in their sermons. Like many others in the movement they prominently feature the biblical quote “the violent take it by force” in their rhetoric on spiritual warfare. There is a tipping point, at which, at which time, because of the sin of the land, the people then have to be displaced … God is preparing a people to displace the ones whose sin is rising so that then they tip over and the church goes in – one is removed and the church moves in and takes the territory. Now, that does not mean that the people are removed, because God removes them from the Kingdom of Darkness into the Kingdom of Light. They are given an opportunity to change allegiances. For more information on other links between Sarah Palin and the New Apostolic Reformation, see Palin and the Apostles at and the entire ongoing series of articles, Palin’s Churches and the Third Wave. Bruce Wilson writes for Talk To Action, a blog specializing in faith and politics. Is Palin a Member of ‘Spiritual Warfare’ Prayer Group?